Simion Barnutiu (21 July 1808 - 28 May 1864) was a Romanian historian, academic, philosopher, jurist, liberal politician and Freemason. A leader of the 1848 revolutionary movement of Transylvanian Romanians, he represented its Eastern Rite Catholic wing. Barnutiu lived for a large part of his life in Moldavia, and was for long a professor of philosophy at Academia Mihaileana and at the University of Iasi. Born in Bocsa, Transylvania, he became a teacher of history at the secondary school in Blaj, which was at the time, like the rest of Transylvania, part of the Austrian Empire. Barnutiu was influenced early-on by the philosophy of Immanuel Kant (Kantianism), in which he saw the means to reform society in opposition to traditional theological views, while supporting a presence of laity in the administrative structures of his own church. An active contributor to Foaie pentru minte, inima si literatura, the literary supplement of George Barit' journal Gazeta de Transilvania, he became noted after 1842 for virulently opposing the decision of the Magyar-dominated Transylvanian Diet to give Hungarian status as a semi-official language in local administration. On March 24, 1848, Barnutiu issued one in a series of appeals by various authors, calling for self-determination of Romanians inside Transylvania, viewing it as a necessary step in matching Magyar success in obtaining rights from Emperor Ferdinand I, and professing that Romanians should reject the projected union of the region with the Kingdom of Hungary until ensured proportional representation and the official condemnation of serfdom. The Blaj Assembly convened in April on the basis of such proclamations gathered together intellectuals, clergy, and commoners. Barnutiu gave several speeches in front of the Assembly, calling for patience and moderation while continuing to campaign against all unilateral change in Transylvania's government and disagreeing with more skeptical political leaders, such as Barit and Andrei Saguna, and finally being persuaded to include an oath of allegiance to the Emperor in his political strategy. Just before the Second Assembly in May, he agreed to moderate his tone further, taking in view the points made by Barit in regard to the fragile situation facing Romanians in the region, and partly reformulated his program on self-determination. On May 17, he was elected vicepresident of the Permanent Committee formed by Blaj delegates as a supervising body (one presided by Saguna), later the basis of the National Romanian Committee. The rapid succession of events after the proclamation of Transylvania's union with the Hungarian Kingdom (July 11) and of Hungary's independence (September 27), with an Austrian military debacle in Transylvania, saw a rapprochement between the loyalist Austrian Anton Freiherr von Puchner, nominal governor of the region, and Barnutiu's Committee. From the Committee's perspective, this was an Austrian recognition of Transylvania's self-government as a Romanian region, which was to be advanced to the new emperor Franz Josef. After Imperial Russian intervention in Transylvania, he decided to go into exile, and settled in Iasi, Moldavia's capital. 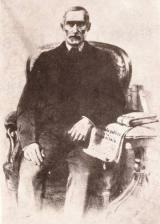 He wrote several treaties on law and philosophy (including a passionate defense of Roman law), and, before and after the union of the Danubian Principalities under Domnitor Alexander John Cuza advocated radical reforms which were a direct inspiration to the Moldavian liberal dissidents grouped as Fractiunea libera si independenta. In the 1850s, Barnutiu wrote against the popular project of electing a foreign prince as ruler of the Principalities, an opposition which Fractiunea carried into the Consituent Assembly following the toppling of Cuza two years after Barnutiu's death. Junimea, a conservative literary society created during that period, criticized him along with other Transylvanian intellectuals (such as Timotei Cipariu, Gheorghe Sincai, and August Treboniu Laurian) for having supported a Romanian grammar and alphabet based on Latin ethymologies instead of one reflecting the spoken language (at the time, "Latinist" influences following Transylvanian guidelines had come to be favoured by the Romanian Academy). After having fallen gravely ill, Simion Barnutiu asked to be allowed to return to his native village. He died on the way there, in Hida.